When we first came to Rwanda we had no idea that we would find so many caves. It turned out that Rwanda has over 50 of them and when we thought about it, it totally made sense - the volcanic landscape in the North West of the country justifies it all. Probably the most popular caves in Rwanda are Musanze Caves which are operated by Rwanda Development Board. Besides Musanze Caves, there are plenty of other little & bigger caves where you can do a bit of spelunking. Finding them may turn out a bit tricky so we put together this post with the things we found out about Rwanda’s caves. In the city of Musanze (Ruhengeri) there are several caves which are quite difficult to find by yourself. You also can’t visit them on your own - they’re operated by Rwanda Development Board and to see them you have to make your way to RDB’s office in the centre of the town (it's searchable on Google Maps & we also talk about it in this post). We were very interested in visiting those caves and made our way to the RDB office to book the tickets, since we couldn't book tickets to the caves online unlike when you visit Volcanoes National Park or Nyungwe Forest National Park. Unfortunately, after finding out that the entry costs 50 USD per person and a visit to the caves lasts 1 hour, we decided to first try visiting the cheaper caves not operated by RDB (such as Mugongo Cave) to see whether we even liked it. We informed an RDB official that we may book their tour to the RDB caves the following day, but first we will visit the cheaper caves, not operated by RDB. To our surprise, the official threatened us that caves not operated by RDB are illegal… even though they’re featured on an official RDB map about the Musanze area. We were informed that if you want to visit Musanze Caves & get the 50 USD ticket, you will be equipped with the proper gear like boots, helmet & torch and you will walk on the safe path with a guide etc. We learnt about this cave when we visited Imbabazi - a former orphanage featured in ‘Gorillas In The Mist’. The cost of visiting Mugongo Cave is 5000 RWF per person (approx. 6 USD) and you need to give Imbabazi a call first (or message them) to make sure there will be someone there to show you around & go with you. You can find their number on their website. 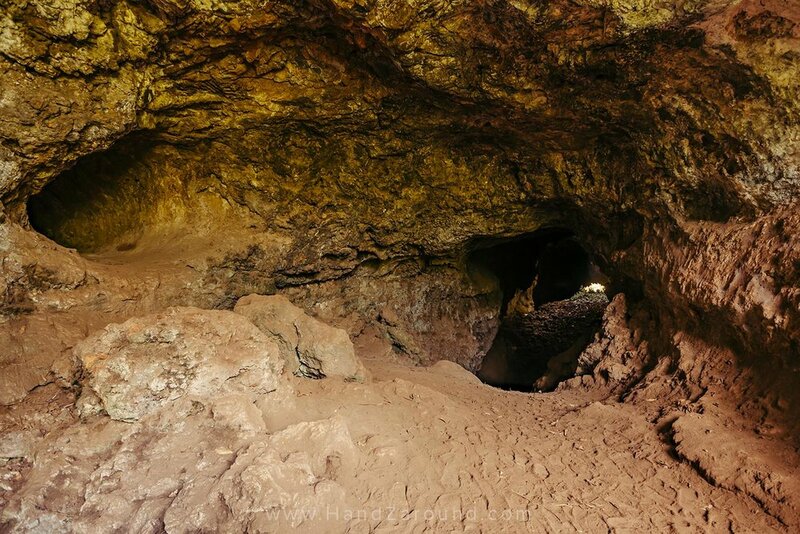 First referred to as ‘an illegal cave’ by the RDB official, Mugongo Cave is absolutely ‘legal’. We chatted to David, who showed us around Imababazi & the cave, and we learnt that the cave and the property it’s on are simply owned by Imbabazi so all the profit goes to them, and not to RDB. We loved the Mugongo cave that's on Imbabazi's property - it's just one cave but it's an exciting little adventure. It's a bit off the beaten track and it’s quite a while from the main road plus you don’t get any helmet or boots - you just go & do it. The entrance to the cave is a bit challenging to get through and may be slippery but once you’re inside, it’s flat (and extremely dark!!!). Then again, the exit is a bit tricky too but David is there to help you. We thought it was totally worth a visit - it may give you chills when you walk in complete darkness and you can’t see the light at the end of the tunnel! There is also another bunch of caves in Musanze, which are not owned by RDB and where technically you can’t visit simply because you would never find them. But since it’s a public space and there are locals happy to show you around, you can decide to see them. The best way to find them is to stop by the Crema Cafe in Musanze (Ruhengeri) and ask about them (whilst having Crema's amazing coffee & a sandwich!). We visited only one cave which was situated in the most unexpected spot - just off the road amongst people’s houses! When we got there, there were plenty of locals around, very interested in us visiting their neighbourhood and the cave. The cave was super beautiful - once we went inside there was a little island with an opening in the ceiling above - the light was shining through and creating a rather stunning view. We heard there are more of those caves in the area and a few years ago there used to be local tours showing people around them but since RDB opened up Musanze Caves, they stopped other tour operators not associated with them from showing tourists the caves. If you decide to visit ‘the unofficial caves’, make sure you pay attention to every step you take - there are rolling stones and massive drops which are not visible without a torch. So only walk where you’re certain of your step. Also, mind the weather - if it’s raining, and you’re spending a lot of time e.g. photographing the cave & standing on a little island, you may not notice that there is water gathering around you. Another matter worth mentioning is the locals being very interested in your visit and seeing it as an opportunity to charge you for your visit. You actually don’t need to pay anyone because you’re in a public space but most probably you will need a guide since you won’t even find the cave without asking someone about it. There may be a lot of ‘guides’ trying to come with you so before you even start, assign the ‘guide’ title to one person and inform them clearly about it so there is not confusion at the end if you decide to pay them a small fee for their time.